Despite the wide range of parenting styles that parents modify to meet the needs of their families, there seems to be a common set of core values that most parents want to instill in their children: kindness and empathy for others. When young children reveal these attributes, parents are proud. Children, in their big and small ways can be quite heroic. Three-year-old Todd was getting ready to watch the movie, Frozen, with his five-year-old brother, mother and grandmother. He single-handedly pushed the small settee in front of the large computer screen. Then he pulled a low table in front of the sofa in preparation for the fruit and popcorn. Then this busy little guy went and got a big, plush pillow and put it in the middle of the back of the settee. What was he up to? When it was time for everyone to sit and watch the film, he took Grandma's hand and had her sit in the middle of the couch between the two boys. Todd had gotten the pillow for Grandma to lean against. Grandma should be comfortable. To Grandma, Todd was her superhero, kind and considerate. He loved her and cared about her feelings. Seven-year-old Dale was playing a game with his grandmother. He set up soft blocks for his barricade and told her to do the same. Then he gave them each a long rectangular soft block which was a machine gun for each. They were going to play a battle game. The winner would get a point when Dale decided who got shot first. Seems like a somewhat violent game, but it's not played aggressively. Each player is to make loud sound-effects which is the fun of it to Dale. He booms loudly with great pleasure when he makes believe his gun goes off. Grandma's sound isn't as heartily and Dale tells her it has to be louder. He's looking for her to make a throaty noise like he makes so easily. After about fifteen minutes of playing the game over and over. Grandma, smiling, confesses to Dale that she just can't make the same sounds that he can. After playing a few more minutes, Dale goes over to a table and writes something on a paper. He gives it to Grandma saying, "You don't have to make a loud noise. You can use this. When you hold it up, you can win." Written on the paper in large, bold letters was the word, "BOOM!" Grandma said, "Thank you. You thought of my feelings and made the game easier for me. That was really nice of you." Dale just smiled. So this ostensibly aggressive game turned into a gentle, care giving game with an empathic gesture. Dale was Grandma's superhero. Four-year-old Vic was a good swimmer when he had his inflatable arm bands on. He would jump in the water on his own even off a diving board. His two-year-old brother, Cole, wanted to be just like him. Whatever Vic did, Cole tried to do, too. This often annoyed Vic who didn't always like being followed around. So, like many older brothers, Vic wasn't always nice to Cole. He would take toys right out of Cole's hands if he wanted them. Cole wouldn't cry, but he also wouldn't give up. He'd just try and do the next thing that his older brother was up to. After being an only child, it can be hard to be overjoyed when a little brother comes along. Parents daydream during the second pregnancy or adoption that the two little ones will be best buddies, but often this daydream turns into a bit of a nightmare. Before the baby's arrival, parents offer many positive ideas about the new sibling becoming an at-home friend. They read lots of cheerful books about families growing. They also follow the baby's arrival with as much one-on-one attention as possible for the first-born. But even with all that effort, it often happens that the first child resents the second. It's hard giving up being the center of your parents' attention. Even the most nurturing kids tend to focus at times not on what they've gained--a brother to play with, but on what they've lost--being an only child. The first child may struggle with the idea that the second child is now a permanent part of the family. In fact, in families that communicate well, that first child might feel confident enough to give voice to his feelings: "I wish he was never born. Send him back!" Back to four-year-old Vic and two-year-old Cole at the pool. Vic's and Cole's parents are visiting with another couple and all the kids are running around the yard. It's a warm day and the pool is glistening. Cole spies Vic sitting at the pool side with his feet dangling in the water. Cole gets excited and runs swiftly to the pool. Because he's going so fast, he falls in. Vic yells, "Cole's in the deep end!" as he jumps in instantly without his arm bands on. He manages to tread water as he struggles to keep Cole and himself from going under. Their father jumps in immediately and gets them both to the edge. It happened so quickly that neither boy was even crying. Vic was indeed a superhero saving his brother faster than the adults. Two-year-old Cole, with his great vocabulary, was up and running chasing after his brother calling Vic with the new name he chose for him, "Victory!" The adults praised Vic over and over and cheered. Even a jealous older brother knows how to do the loving thing when it really counts! What a superhero, indeed. What Do Parents Learn from their Children's Heroic Behavior? As parents we learn that our kids are empathic and kind even as young as three because we model nurturing behavior towards them. We can be grateful to gain such joy from our kids! 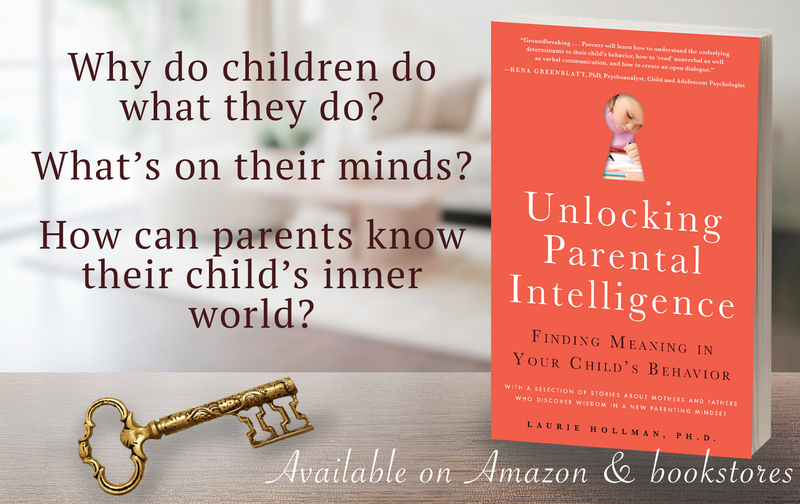 Dr. Laurie Hollman is a psychoanalyst with a recent book, Unlocking Parental Intelligence: Finding Meaning in Your Child's Behavior, found on Amazon, Barnes and Noble, Familius and wherever books are sold.